Brighouse Town have a chance to go three points clear at the top of the Evo-Stik NPL’s East section when they host Pickering Town tomorrow (7.45). Vill Powell’s men made it 10 points form five games with a 3-1 home win over Loughborough Dynamo yesterday and trail leading pair Marske United and Stamford only on goal difference. As Monday is Brighouse’s preferred night for midweek home matches, they could steal a march on their rivals with victory over the third from bottom side. 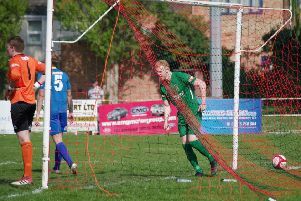 Pickering lost their opening four matches but got off the mark yesterday with a suprise 2-1 win at Lincoln United. Brighouse were 3-0 up shortly after half time at Hove Edge. Aaron Martin gave them the lead on 29 minutes and pressure from Mohammed Ibrahim then forced the Dynamo keeper into an error. Tom Haigh cashed in. That goal came one minute before the break and good work from Martin and Ibrahim paved the way for Tom Robinson to add an easy finish two minutes after the resumption. Dynamo, who had taken three points from their previous three games, got one back through Ryan Robbins with 12 minutes left.